NOTE from DearMYRTLE: The following was received from the folks at BackupMyTree.com. This is a new company, and I am unfamiliar with their product. But in an accompanying PowerPoint, the following graphic demonstrates that the backup is a sync process, which intrigues Ol'Myrt. The two individuals named in the ABOUT page have produced quality products in the past. Please address all inquiries to support@BackupMyTree.com. Boulder, Colorado – September 13th 2010 – BackupMyTree (www.backupmytree.com), a new service offering free and automatic backup of family trees, launches today. 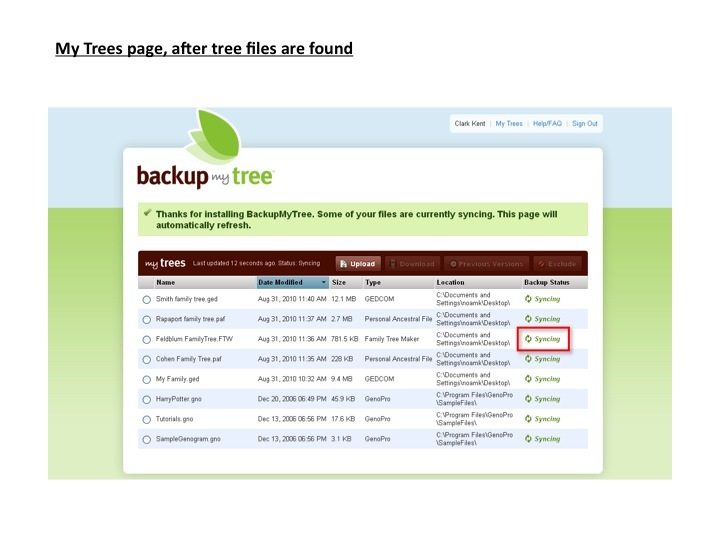 BackupMyTree enables worry-free research for genealogists and family history enthusiasts, preventing loss of years of work due to a computer disaster such as a virus or hard disk crash. By automatically finding family tree files and creating a remote, off-site backup, BackupMyTree’s software ensures complete protection of family tree data. · Support for a wide array of family tree file formats created by popular family tree software packages - Family Tree Maker, Family Tree Builder, PAF, Legacy Family Tree, RootsMagic (version 4 or later), and Family Tree Legends. Industry standard GEDCOM files are supported too. · Anywhere access of family tree files – users can access their family tree files securely from anywhere using a web browser. · Monitoring of all family trees for changes and automatic backup of the updated files. · Storage of previous versions of family tree files should anything become corrupted. This feature also protects against accidental deletion of information inside a family tree – enabling users to retrieve any previous version of their data. · Instant retrieval in case of data loss - by simply re-downloading the latest family tree backups. · Complete protection of all family tree files using strong SSL security during transfer from computers to the BackupMyTree servers. BackupMyTree is the creation of Cliff Shaw, whose previous successes in genealogy include GenForum, Family Tree Legends and GenCircles.